DA NANG, Vietnam, Nov. 7 (Xinhua) — Trade officials, ministers and economic leaders from 21 members of the Asia-Pacific Economic Cooperation (APEC) are gathering here this week for a series of meetings and an annual summit with regional integration, inclusive development and a post-2020 vision. Against a backdrop of rising trend of deglobalization and protectionism especially in the industrialized world, such as the U.S. withdrawal from the Trans-Pacific Partnership (TPP) and Brexit, APEC leaders need to reiterate their commitment to a free and open world trading system, observers and experts said. Peter Drysdale, professor of economics of the Australian National University, said "The test for this APEC is whether to declare firmly for open regionalism, and multilateral trading arrangement, so the kind upon which APEC prosperity is built." APEC was established in 1989 as a forum for 21 Pacific Rim economies to promote balanced, inclusive, sustainable and innovative growth by accelerating regional economic integration throughout the Asia-Pacific region. "If we retreat from those principles, if we allow to be pushed away form the principles, if we show weakness in defending those principles, then we challenge our own prosperity, we challenge our own peaceful inter-dependence," Drysdale told Xinhua. "So that’s why APEC is so important." Noting that the U.S. economy is picking up and the world’s economic recovery is underway, Drysdale said the recovery is still slow and fragile. Under this circumstance, the politics of the industrialized countries especially North America and Europe pose great challenge to those APEC principles, he pointed out. The Asia-Pacific regional integration has witnessed changes and developments in the past couple of years — the United States moved out of TPP, the Regional Comprehensive Economic Partnership (ASEAN plus six dialogue partners — China, Japan, South Korea, Australia, New Zealand and India) was under discussion, the Pacific Alliance with Latin America expanded to include new members, and the ASEAN Economic Community was set up. Experts believed an envisaged Free Trade Area of the Asia Pacific (FTAAP), which includes all 21 APEC economies, is an effective way to reduce the "spaghetti bowl effect" of overlapping regional trade agreements and fragmentation risk in the Asia-Pacific. Alan Bollard, executive director of the APEC Secretariat based in Singapore, said APEC would like to see "some improved recipes for cooking the noodles," and APEC members were testing the kitchen for trying things out. "APEC leaders would expect to see, at the upcoming summit, work going on identifying bottlenecks around potential realization of FTAAP," he said. At the APEC meeting in 2014, the Beijing Roadmap was adopted to push forward the FTAAP process and a collective strategic study on this plan was approved at last year’s summit in Lima. Concrete steps and measures are expected to follow to enhance the development of the Asia-Pacific, and even the whole world, by means of integration and connectivity. "FTAAP is the only proposal so far that includes both the United States and China," said Jayant Menon, lead economist of the Asian Development Bank (ADB). Liu Chenyang, director of APEC Study Center at China’s Nankai University, said that as an important driving force for multilateral free trade and investment, FTAAP will take the economies closer to the Bogor Goals and show the way for Asia-Pacific economic and trade cooperation beyond 2020. APEC has been working to achieve the Bogor Goals, a cornerstone of APEC agenda that is aimed at liberalizing trade and investment among the developed economies by 2010 and developing economies by 2020. Observers asserted that it is time for the region to prepare for the post-2020 vision, which centers on linkage and integration, trade investment and services liberalization, associated with the requirements of sustainable development. 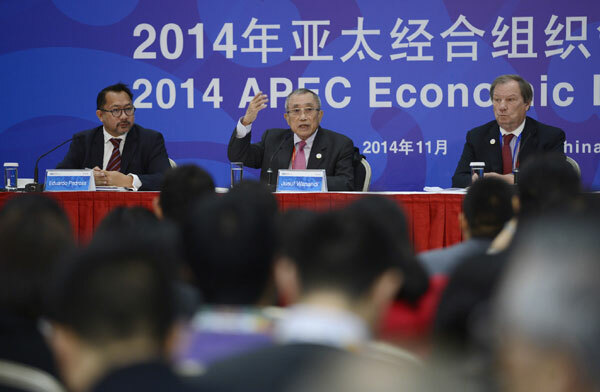 "With continued progress in achieving the Bogor Goals, good in some areas, but slower in some other areas, APEC leaders will examine in the next few years whether APEC should keep working toward the Bogor Goals after 2020 or look for new directions," Bollard told Xinhua. The roadmap will be an important foundation for APEC to build and shape the future of cooperation after 2020, focusing on broader goals of trade and investment liberalization, and better address new opportunities and challenges such as sustainable growth, innovation and e-commerce. Bui Thanh Son, Vietnamese deputy foreign minister and vice chairman of the APEC 2017 National Committee, said: "I hope that APEC leaders will share vision for the forum’s future after 2020 and give instructions on preparatory steps to shape this future."